Vol.13 "Narahara Ikko - Double Vision "
Narahara Ikko was born in 1931 in his mother’s hometown of Omuta City, Fukuoka Prefecture. His father’s position as a court judge kept the family moving around the country, leading Narahara to have a boyhood with no stable place to belong. After beginning his activity as a photographer, Narahara traveled the world, staying in parts of Europe and the USA for long periods at a time but continuing to move around and around, perhaps affected by the experiences of his youth. Narahara held his first solo exhibition, “Human Land” (Matsushima Gallery, Tokyo), in 1965. It put side by side the island of Hashima (also called Gunkanjima), a manmade island off the coast of Nagasaki created to support a coal mine, and Kurokami Village, a small village at the foot of the active Sakurajima volcano, presenting a dichotomy between “man versus society” and “man versus nature”. This debut exhibition had a deep impact, turning a simple graduate student studying art history at Waseda into a notable young photographer by the end of its course. His 1958 solo exhibition, "Domains" (Tokyo, Fuji Photo Salon), was also a product of notions of dualism. The comparison of a men’s monastery in Hokkaido (Land of Silence) and a women’s prison in Wakayama (Within the Walls) approaches themes of polarization like man/woman, religious/secular, free will/force. The works in these two series approached the question of what is necessary for human life in confined space. In 1959 Narahara collaborated with Tomatsu Shomei, Hosoe Eiko, Kawada Kikuji, Sato Akira, and Tanno Akira to create the photographer’s group VIVO; together, they created what was one of the brightest seasons in the history of Japanese photographic expression. After the disbandment of VIVO in 1961, Narahara based himself in Paris and traveled Europe from 1962~1963, then settled in New York from 1970~1974. He published several series in the following years, such as “Where time has stopped - Europe” (Kagoshima Kenkyujo Shuppansha, 1967), “Espana: Grand tarde, Fiesta, Vaya con Dios” (Seiryudo, 1969), “Japanesque” (Mainichi Shimbunsha, 1970), and “Where time has vanished” (Asahi Shimbunsha, 1975); these works showed the development of his “double vision” that saw both the external and internal at the same time, a concept which matured over he spent time between Japan and the West. Narahara continued his search for “spectacles where outer reality and the realm of the inner domain of the heart meet and become one” throughout and after the ‘80s, creating many diverse photo works. It’s significant that the last work Narahara has presented is called “Double Vision - Paris” (2000~2002). Seeing the photos of Paris that he printed slightly staggered one over the other, it is possible to understand the way he might see the world. Vol.13 "Narahara Ikko - Double Vision"
Vol.12 "Q Ei and photo dessin"
Vol.11 "Fukuhara Shinzo 1883-1948 -- Japanese Landscape Photography"
Vol.10 "The city observer’s gaze Akihiko HIRASHIMA (1946~)"
Vol.9 "Hitoshi FUGO 1947- -- The unusual world of works which fuses thought and technique"
"ETSURO ISHIHARA - THE EXTRAORDINARY GALLERIST WHO TURNED PHOTOGRAPHY TO ART"
Vol.4 "Shoji UEDA -Locality open to the world-"
Vol.3 "Yu OGATA, ICHIRO OGATA ONO -Dyslexia's picture of the world-"
Vol.2 "Eikoh Hosoe's theatrical imagination"
Born 1954 in Miyagi prefecture, Japan. 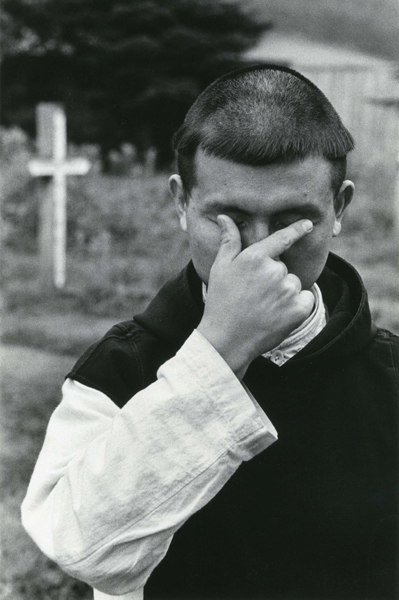 Iizawa is a Japanese photography critic, historian of photography, and magazine editor. He studied photography in Nihon University, graduating in 1977. He obtained his doctorate at University of Tsukuba in 1984. With his trilogy, "Geijutsu shashin to sono jidai (Art Photography and its Time)", "Shashin ni kaere (Go back to the photography)" and "Toshi no shisen (Glance of the City)" published in 1986, 1988 and 1989, he stood out and became the representive photography researcher of the early 20th century. Iizawa founded magazine "Deja-vu" in 1990 and was its editor in chief until 1994. He has been taking part as a judge in public competitions "Shashin-shinseiki (New Generation Photography)" and "Hitotsubo-ten (3.3m² Exhibition)", since their beginning, and through these competitions made the "girly photo" trend in the 1990s. Reknowned as Nobuyuki Araki researcher. In 1996, he was awarded the Suntory Arts Award for his book "Shashin bijutsukan e yokoso (Welcome to the Photography Museum)". Also, he is an enthusiast for mushrooms and published books such as "Sekai no kinoko kitte (World's Mushroom Stamps)" and "Aruku kinoko (Walking Mushrooms)". He was a part-time instructor at the Tokyo College of Photography in 1981, teaching Photography Artist Research. In 2004 and 2008, he was a part-time lecturer at Faculty of Liberal Arts, University of Tokyo, teaching history of photography in Japan. Copyright（c）2012 TOKI-NO-WASUREMONO／WATANUKI　INC. All rights reserved.